While, I have been reporting upon all of our many nocturnal outings, don’t think that we have been lackadaisical during the day, because we haven’t. With Cycle Zydeco fast approaching we have been literally working our butts off, trying to get ready for that tour. This weekend’s exceptionally fine weather only added fuel to the fire in our hearts to get out there and ride. It’s hard to remember how many times that we rode last week, but I think that I was out on the bike everyday save one and Anne was with me most of the time. The one day that I missed was Thursday, which was also supposed to be the day of the Cardinals home opener, but weather caused that to be postponed until Friday. Friday’s Post-Dispatch had a headline labeling the day as a holy day of devotion, which any member of the Church of Baseball would understand. This year former Cardinal pitcher Bob Gibson is being fêted. 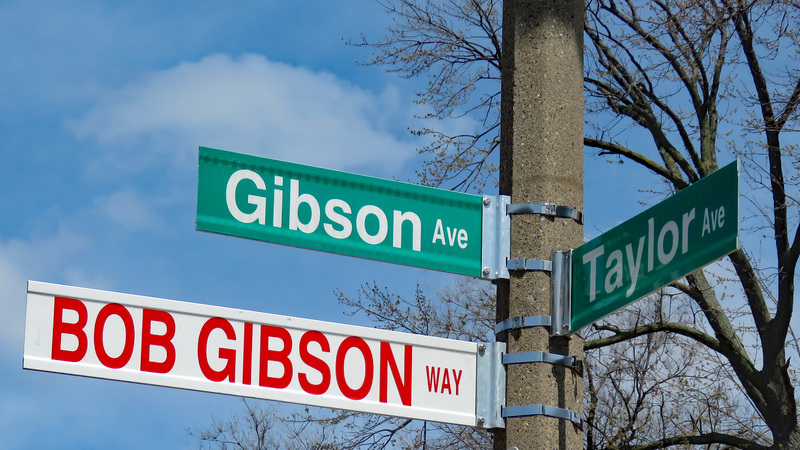 The city has even cast honors on him by specifically naming a street in his old neighborhood after him. We had been mainly bicycling in Forest Park, but as our strength grows and the number of miles ridden increases, doing the gerbil trail has gotten a little monotonous, not to say dizzying. On Saturday, we simply cruised through the park and continued on to Tower Grove Park and lunch on South Grand. It was then that we rode down Bob Gibson Way. When the weather becomes this exceptionally fine, Forest Park becomes quite the zoo and not in no small part because of all of the zoo traffic. We could see and had to circumvent all of the preparations for the Saint Louis marathon on Sunday, so there was no way we were going anywhere near the park then. I installed the trailer hitch bike rack on the Prius and we headed over to the East Side and the trails of Madison County. We parked in Collinsville at the trail’s HQ and headed east to Horseshoe Lake, which is an oxbow lake near Cahokia. We were doing fine, until a cop standing in the middle of the trail told us to turn around. There was some sort of police action up ahead. His demeanor brooked no argument and we obliged. It was only later that I wondered if a body had been found. Horseshoe Lake is a favorite dumping ground. There’s a saying around town, if you want to get away with murder, do it on the East Side. Anyway, we had one more detour, but this one was construction related and we eventually made it back to the car. There’s a Culver’s next door to the trailhead and we hit it for some upscale fast food. It will be back on the bike tomorrow, weather permitting. As I’m writing, it has turned into a dark and stormy night. This entry was posted in Bicycling, Saint Louis by RegenAxe. Bookmark the permalink. Bob Gibson was one of my favorite pitchers along with Don Drysdale. Both were similar in that neither seemed to have any compunction about drilling an opposing hitter for even the slightest offense. Glad to see that they named a street after him. I also liked that about Gibson, but while Drysdale was pitching, I was a Giants fan, so, you know.. I subsequently moved to St. Louis.